In order to actually tell the pixels what to do, a pixel controller is needed to translate the commands from Falcon Player into data the pixels understand. For all of the pixels on the house, we use an E682 pixel controller from Sandevices. We actually have two of these, and as of 2017 both are used in the show. Originally, the second one was used for testing strands of pixels and as a backup if something happens to the first one. Perhaps it is time to get one more to have on hand. 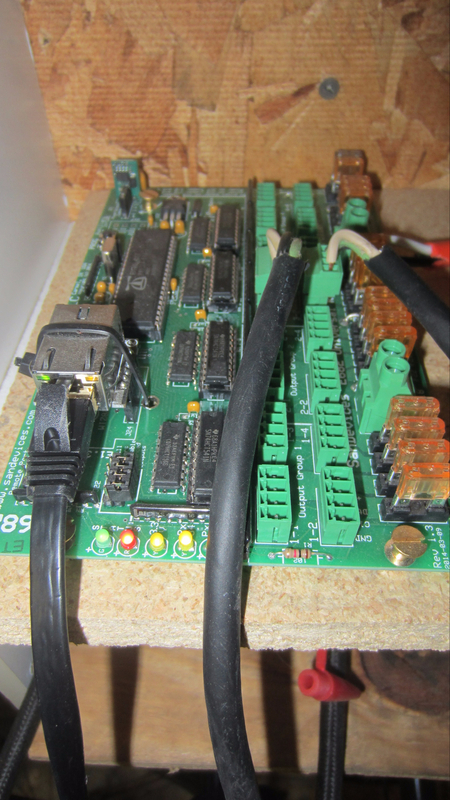 One of our Sandevices E682 pixel controllers. This one lives in the garage and only drives 2 universes of pixels but we will likely utilize it more in the future as we add elements to our display. The Ethernet cable connecting to the pixel controller comes from the router in the attic and the power comes from a 12V 30A power supply sitting on the shelf nearby. You can buy these controllers preassembled/tested for ~$190, but it is way more fun to buy it as a kit of parts and a circuit board that you have to solder for ~$110. All of the components are through-hole and relatively easy to solder, though we would recommend something nicer than a cheap Radio Shack soldering iron for the task. Philip has a fair bit of soldering experience and a decent Weller soldering iron and it took him about 2 enjoyable hours with the TV on in the background to assemble the controller (3 hours for the first one because he didn’t realize there were instructions and was figuring it out on his own!). On that note, there is a very helpful assembly instruction manual on the Sandevices website that clarifies exactly what parts go where and what the recommended order of assembly is. You can mostly figure it out without the manual but it definitely makes it go faster and gives confidence that you are putting components in the correct places. The manual also explains the very simple testing procedure to make sure the board is functional once assembled. The controller has independent 5 amp fuses for each universe, as well as a 2 amp fuse protecting the electronics on the board itself. These are standard auto fuses and it may be worth having a few extra on hand in case you run into problems with wiring. We hooked up our very first strand of pixels incorrectly (got the wires in the wrong order) and quickly blew a fuse. Fortunately, the controller comes with one or two extras and nothing was permanently damaged. We picked up a handful of extras to live in the attic next to the controller in case we burn out any more fuses. The controller is versatile and can be run at 12V, 5V, or a combination of both. The controller offers a web interface that is used to configure the enabling/mapping of the 16 universes it can control and to test pixels. You may have noticed by now that our Christmas light setup requires a ridiculous amount of mapping that all needs to be aligned properly! The controller has a static IP address of 192.168.1.206. Documentation on the Sandevices website explains how to change the address if you have more than one of these controllers in your show. For pixel testing, there are several different test patterns the controller supports. It is fun to try them all out on your own, but we found 11 to be one of the coolest visually and 10 to be the best for testing our power consumption and power injection solution as it commands bright white at full power.